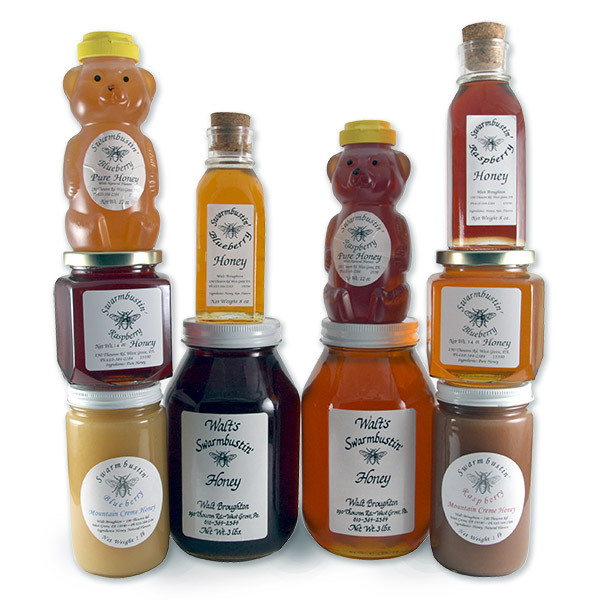 Swarmbustin’ Honey is a family run operation dedicated to our Beeloved Honey Bees. We are located near Chatham in Chester County, PA. Collectively, my sons Abram, Luke, Jeb, and I have in excess of ten decades of beeing with the bees. The Bustin’ of Swarms is a passion shared by all of us here at the Bee Farm. We have tales for days, with each adventure presenting interesting challenges. All of our Honey is Raw. Our Golden Nectar, Black & Gold, Fall Wildflower, and Buckwheat are four shades of pure honey that represent the distinctive honey flavors made possible by the diversity of seasonal floral sources available to the honeybees. Our Totally Raw is just that, with no Heating or Straining at all. Besides our Raw Honey, Swarmbustin’ Honey is proud to offer fresh bee pollen. All orders totaling in xcess of $80 are eligible for a FREE 6.5oz. jar of our Cremed Hot Garlic Honey, while supplies last. This Condiment is certain to enhance all food which it connects with. Whether it bee your Omelette, Breakfast Tea or Favorite Appetizer; Stir Fry, Grilled Game or Ice Cream, the recipients of your Morsels will bee Deelighted! Visit this link For More about our Spicy Honeys. I’ve been told that this batch of Cremed Hot Garlic Honey, created for CHILIHEAD Enthusiasts, should come with a FOREWARNING! To receive this promo, found in Spicy Honey, simply add to your order and use the coupon code FREEBEE on checkout, and $6.50 will bee deducted. To qualify for FREE BEES, Do Not include shipping fees or cost of promo items when calculating the required minimum purchase. Un-heated, un-filtered honey, with all of the enzymes intact; this honey is a medical marvel as well as a culinary delight. Totally Raw honey is simply spun out of the honeycomb and allowed to crystallize naturally. May be used for all honey needs or as a sugar substitute. One pint is 1.5 pounds or 24 ounces.